Dams have been and continue to be very important resources to a country’s development. Before the availability of alternative energy sources, power generated by the flow of water had been nature’s best option. Electricity drives today’s world – a world that is consumed by expanding energy demands.When the Earth’s population was much smaller, it was easy to simply cut down some of the many trees that covered the land and use it for building and for fuel. It was accessible and “free”. I question whether it was ever really free. As the global population has expanded, many areas around the world have many fewer trees to cut down, yet there remains the need fuel for cooking and heating fuels. Virtually, every part of the planet has reserves of fossil fuel. Some areas are rich in petroleum. Some are rich in natural gas. Countries with diverse river and stream systems have used water to drive turbines that drive electrical generators. I have written numerous posts on energy and several on the importance of dams. As with any issue, a person’s viewpoint – in favor of or opposed to – is influenced by need. Need is often driven by facility and cost. If something is easy to get and inexpensive, more people will want it. Since the earliest days of dam construction, there has been an environmental cost. This is not a direct cost, meaning a charge for the environment does not appear on a monthly bill. Perhaps the environment needs a cost for people to truly understand its worth. However, there is most definitely a cost. There is a saying in business: “There is no free lunch.” It’s meaning is simple enough. If someone offers to by you lunch, you can bet that one day you will be asked for something in return. The Godfather was even clearer in the meaning whenever his “assistance” was needed: “Someday, and that day may never come, I will call upon you to do me a service in return.” The day eventually does come and payback is most definitely required. When humans need power whether electrical or personal, there is often little justification required to obtain what is needed. I think that dams fall into that category. There are enormous benefits that accrue from dam building. A major benefit in today’s world is the atmospheric benefits over coal, the world’s fuel of choice because of its abundance. Emissions from burning coal are significant. To truly understand the implication of hazardous air pollutants from coal – such as mercury, arsenic, lead, hydrochloric acid, hydrofluoric acids, dioxins, and other toxic substances from coal-fired power plants, I recommend reading this 46-page EPA Report: Emissions of Hazardous Air Pollutants from Coal-fired Power Plants. Here are a few additional facts to put the importance of coal into perspective. Over 440 power plants greater than 25 megawatts located in 46 states and Puerto Rico, burn coal to generate electric power; coal combustion accounts for 45% of electricity produced in the United States. Hazardous air pollutants emitted to the atmosphere by coal-fired power plants can cause a wide range of adverse health effects including damage to eyes, skin, and breathing passages; negative effects on the kidneys, lungs, and nervous system; the potential to cause cancer; impairment of neurological function and ability to learn; and pulmonary and cardiovascular disease. Given stats like these, turbine-generated electricity produced by dams seems justifiable. There are more than 40,000 large dams worldwide. There are more than 300 major dams – giants which meet one of a number of criteria on height (at least 150 metres), dam volume and reservoir volume. China has around 19,000 large dams. The US is the second most dammed country with some 5,500 large dams, followed by the ex-USSR, Japan and India. The countries with the most large dams under construction are currently China, Turkey, South Korea and Japan. These numbers don’t tell the whole story. At least there are groups in the US lobbying to ensure that the pro’s and con’s are discussed and understood. That does not ensure favorable resolution. In China, the story is very much different. With a population of 1.3 billion people and an accelerated modernization program, there are a lot of decisions being made without understanding -or, without caring about – the environmental and human costs. Given China’s explosive economic emergence and large population, justifications to proceed can be easily presented. How large is China’s current dam building exercise? Here is just one example. There are significant Pro’s and Con’s in the continued expansion of China’s dam program. 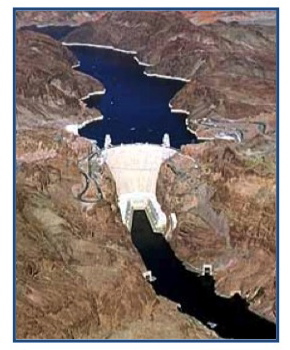 Whether looking at the current state of Lake Mead in the United States: Lake Mead – Declining Water Levels or China’s Three Gorges Dam: Enormous Mistake or Engineering Marvel, the implications of dams cannot be overlooked. The stakes are very high. This article from Circle of Blue: Surge of New Dams in Southwest China Produces Power and Public Ire provides additional details. Before we get too secure in our views, we need only to look at dams in our own country. We have had enough experience that the we understand the costs and the benefits to economies and water and wildlife quality that depends on fresh, accessible water. This entry was posted in Human Innovation, Water and tagged climate change, energy, Global, human blunders, rivers, sustainability. Bookmark the permalink.